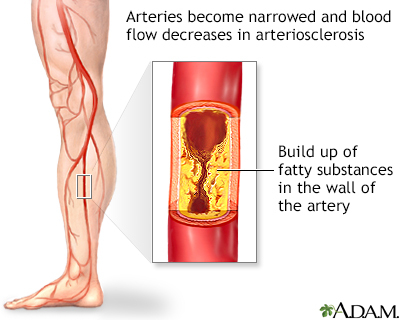 Peripheral artery disease (PAD) is a condition of the blood vessels that supply the legs and feet. It leads to narrowing and hardening of the arteries. This causes decreased blood flow, which can injure nerves and other tissues. PAD is caused by "hardening of the arteries." This problem occurs when fatty material (plaque) builds up on the walls of your arteries and makes them narrower. The walls of the arteries also become stiffer and cannot widen (dilate) to allow greater blood flow when needed. As a result, the muscles of your legs cannot get enough blood and oxygen when they are working harder (such as during exercise or walking). If PAD becomes severe, there may not be enough blood and oxygen, even when the muscles are resting. The main symptoms of PAD are pain, achiness, fatigue, burning, or discomfort in the muscles of your feet, calves, or thighs. These symptoms most often appear during walking or exercise, and go away after several minutes of rest. At first, these symptoms may appear only when you walk uphill, walk faster, or walk for longer distances. Slowly, these symptoms occur more quickly and with less exercise. Your legs or feet may feel numb when you are at rest. The legs also may feel cool to the touch, and the skin may look pale. Blood tests may show high cholesterol or diabetes. Balance exercise with rest. Walk or do another activity to the point of pain and alternate it with rest periods. Over time, your circulation may improve as new, small blood vessels form. Always talk to the provider before starting an exercise program. Stop smoking. Smoking narrows the arteries, decreases the blood’s ability to carry oxygen, and increases the risk of forming clots (thrombi and emboli). Take care of your feet, especially if you also have diabetes. Wear shoes that fit properly. Pay attention to any cuts, scrapes, or injuries, and see your provider right away. Tissues heal slowly and are more likely to get infected when there is decreased circulation. Make sure your blood pressure is well-controlled. Aspirin or a medicine called clopidogrel (Plavix), which keeps your blood from forming clots in your arteries. DO NOT stop taking these medicines without first talking with your provider. Cilostazol, a drug that works to enlarge (dilate) the affected artery or arteries for moderate-to-severe cases that are not candidates for surgery. Medicine to help lower your cholesterol. If you are taking medicines for high blood pressure or diabetes, take them as your provider has prescribed. Some people with PAD may need to have the limb removed (amputated). Most cases of PAD of the legs can be controlled without surgery. Although surgery provides good symptom relief in severe cases, angioplasty and stenting procedures are being used in place of surgery more and more often. Bonaca MP, Creager MA. Peripheral artery disease. In: Zipes DP, Libby P, Bonow RO, Mann DL, Tomaselli GF, Braunwald E, eds. Braunwald's Heart Disease: A Textbook of Cardiovascular Medicine. 11th ed. Philadelphia, PA: Elsevier Saunders; 2019:chap 64. Murphy TP, Cutlip DE, Regensteiner JG, et al. Supervised exercise, stent revascularization, or medical therapy for claudication due to aortoiliac peripheral artery disease: the CLEVER study. J Am Coll Cardiol. 2015;65(10):999-1009 PMID: 25766947 www.ncbi.nlm.nih.gov/pubmed/25766947. Simons JP, Robinson WP, Schanzer A. Lower extremity arterial disease: medical management and decision making. In: Sidawy AN, Perler BA, eds. Rutherford's Vascular Surgery and Endovascular Therapy. 9th ed. Philadelphia, PA: Elsevier; 2019:chap 105.